Created in collaboration with Jack Chung, Shelley Evenson, and Paul Pangaro. The creative process involves many conversations—about goals and actions to achieve them—conversations with co-creators and colleagues, conversations with oneself. The participants and their language, experience, and values affect the conversations. See also our How do you design? collection of models. These are stunning. Thank you for the inspiration! I recently drafted a similar process (collect ideas, sort helpful/unhelpful, group ideas, connect the dots, bring it to life). This seems to say the same thing, only the layout is much more helpful than my quick note in my moleskine! I can’t fully see this on my iPhone but totally get the gist of it and can make out the overall structure. Looks neat, will download PDF when I get home. just come for a check up to see if there are an new ones, loved the innovation and behold, there is creativity. quite relevant to a graphic designer will have to remember march time a new one due. very good, thanks. lovely circles to resound with design and the creative process in a loop. great stuff. Your concepts maps have always been remarkable and informative. Well done on this one! Give my regards to Paul Pangaro. Great job, thanks for the pdf. Going to try to put this up in the office. you should put this into prezi (prezi.com), it would work really well. Great work! Are you guys OK with printing these posters for use in our offices? Hanging this up at my desk as we speak. Absolutely stunning! Love the design, love the concept, love the layout! What tool did you use to draw them? Illustrator? I was all for the concept until I tried to read the text in the two right areas. How am I supposed to read not only upside down but at an angle? I would issue a terse “do it over!” if I had been in charge of this project. To call this good design is a bad joke. You talk about the creative process and the design process as if they are the same thing. Musicians, artists and designers may well use different processes. Cool idea, but it’s hard to read. 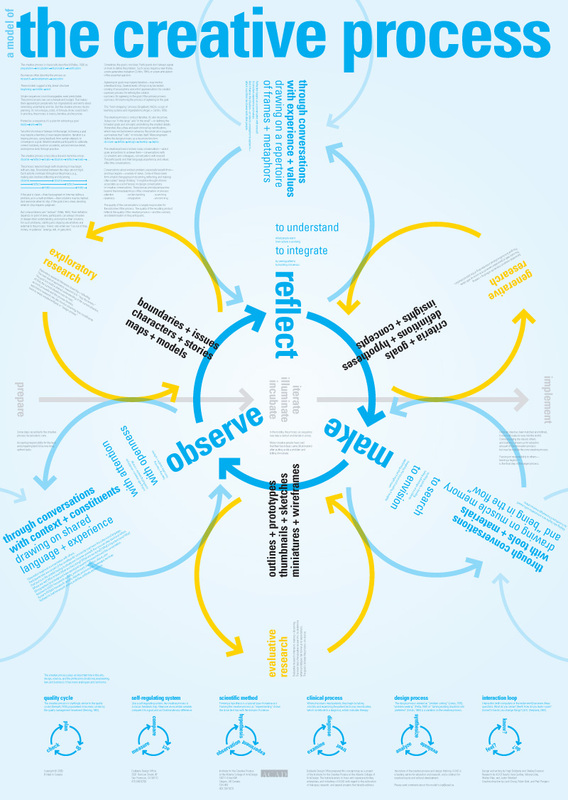 Great job – a really nice visualization of the process.